Orichalcum or aurichalcum is a metal mentioned in several ancient writings, including the story of Atlantis in the Critias of Plato. Within the dialogue, Critias claims that orichalcum had been considered second only to gold in value and had been found and mined in many parts of Atlantis in ancient times, but that by Critias' own time orichalcum was known only by name. A fourrée is a coin, most often a counterfeit, that is made from a base metal core that has been plated with a precious metal to look like its solid metal counterpart. The term is normally applied to ancient silver-plated coins such as the Roman denarius and Greek drachma, but the term is also applied to other plated coins. The double sestertius was a large Roman coin made of orichalcum (brass) first issued by Trajan Decius in AD 249-251, as a response to the inflationary pressures of the time which had devalued the buying power of the conventional sestertius. In reality the new coin was little bigger than the traditional sestertius, which by then was being manufactured at a lower weight and smaller size than it had originally been, and was not a success. 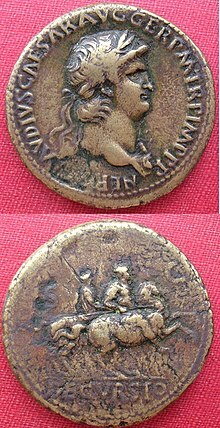 The new coin fell out of use but was revived by the rebel emperor Postumus (259-268), who ruled a breakaway empire consisting of Britain, Gaul and parts of Germany, and was keen to associate his regime with a reformed coinage system. Postumus issued his own version of the double sestertius, often taking very worn old sestertii and using these to overstrike his own portrait and legends on, probably because of a shortage of metal. After his reign, the Roman coinage system degenerated further with almost the only circulating pieces being very debased double-denarius coins, known to us as antoninianii or 'radiates'. Older coins like the sestertius soon dropped entirely out of use, with many being melted down to create new radiates. By the fourth century AD even these had been discontinued and an entirely new coinage system had been created.